The floor of the aquarium is usually covered by a loose medium such as fine gravel, known as the substrate. As well as looking decorative, this has some practical benefits: it provides a bed for biological filtration, an anchorage for aquatic plants, and – for some fish species – a place to forage for food or to make spawning pits. The choice of substrate medium depends partly on the type of fish you intend to keep and may affect water conditions. For example, while ordinary aquarium gravel is inert and does not affect water chemistry, coral gravel causes a rise in water hardness and pH – due to the limestone dissolving in the water. Some freshwater fish, notably Rift Valley cichlids, need these water conditions and so will benefit, whereas for other fish it would be harmful. If you use a very pale gravel, bear in mind that it will deaden the natural colour of the fish, making them look paler than normal. Coral sand is usually only recommended for marine aquaria, because its very fine particles may cause gill irritation in some freshwater fish. Coarser limestone gravel is safe in this respect, and may be mixed with ordinary gravel if desired, to reduce any glare on the fish. For fish that require soft water conditions, granite gravel is recommended; this should not contain any calciferous (lime-based) particles which would dissolve and make the water harder. In some instances, a dark or undyed black gravel is a good choice, such as in an aquarium housing fish that normally live in subdued lighting conditions, but be wary of dyed gravels. You may come across gravel that has not been graded by sieving and so contains both large and small particles. Standard aquarium gravel is much more even in size, with a particle size of about 3mm, making it more suitable for a filter bed above an undergravel filter. To calculate the amount of gravel required, allow roughly 1kg per 4.5 litres (21b per gallon), based on the tank’s total volume. You will need a layer of gravel approximately 3in (7.5cm) deep above an undergravel filter, to ensure that it functions correctly, although this may be less with a different filtration method. Although ready-bagged gravel is often sold as pre-washed, it is still advisable to clean it again under a running tap. Without this precaution, very fine particles, mud, and other debris may form an unpleasant scum on the surface once you fill the new tank. There is also a risk that harmful microbes could be introduced in dirty gravel, so play safe by using a special, safe aquarium disinfectant initially. First tip the gravel into a clean bucket, then make up the appropriate strength of disinfectant solution according to the instructions. Stir the gravel around in the disinfectant, then leave it to stand in the bucket before rinsing it off. A plastic colander is useful for this purpose. Only rinse the gravel in small batches; this makes it easier to wash it thoroughly, removing all traces of disinfectant. Once the water emerging runs clear, the gravel should be ready to landscape onto the aquarium floor. Certain types of fish tend to root in the substrate as part of their natural behaviour, in which case a softer, finer medium than gravel is preferable, at least for part of the area. For example, the elephant-nosed fish (Gnathonemus species) likes to search for food on the bottom with its soft, sensitive snout, and a coarse material makes it hard for them to do this. The obvious alternative to gravel is sand, but this tends to impede an undergravel filter; silver sand is preferable, which is less prone to clogging. 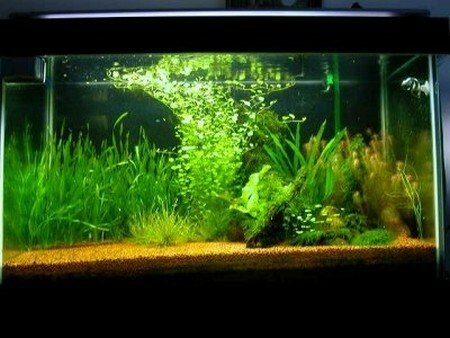 Ideally, you should use a different method of filtration with a sand substrate. For fish that like soft water, peat may be a better medium than sand. If you are using sand, you should disinfect and wash it thoroughly before adding it the aquarium, in the same way as for gravel, above. Use a large sieve with a reasonably fine mesh for rinsing rather than a colander, or you may lose most of it down the drain! For certain fish, such as some killifish, a soft peat base is preferable to gravel, particularly if you want to encourage them to breed. The killifish will burrow into it, most of all when they mate and lay their eggs. Obtain suitable peat from a specialist aquarium outlet; don’t be tempted to use the kind of peat sold for garden use. Place the peat in the base, position plants, wood, or stones to help keep it in place, then add the water. At first, some peat will probably float to the surface, but before long it should become saturated and sink again. At this stage, the water level may be topped up as necessary. A fairly gentle filtration system is usually required in conjunction with this type of substrate, rather than a power or undergravel system.